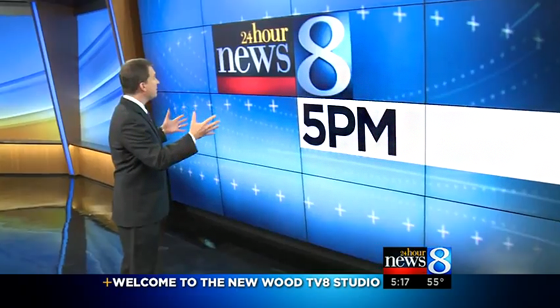 WOOD-TV, 24 Hour News 8, switched to an upgraded set Monday. The new set is by Orlando based designer FX Design Group. Sitting behind a large desk, the anchors pop off a highly graphical background. The news desk includes four monitors with one vertical monitor camera center. The new sets marquee feature is a massive 4×4 monitor array comprised of 55″ bezel-less monitors. The monitors can be feed as a whole, or individually, to present different data throughout. The station envisions using this for election coverage and standups. A secondary standup position with interactive touchscreen is located camera left. 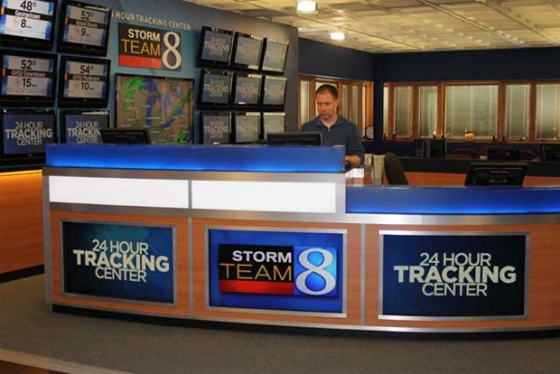 The stations weather center is uniquely located between the studio and a set of offices. The working weather center is complete with many monitors and branded elements. Overall, the set is a major upgrade for WOOD-TV and is cohesive. It’ll be interesting to see how they use the large monitor wall and if that appears on other sister stations. 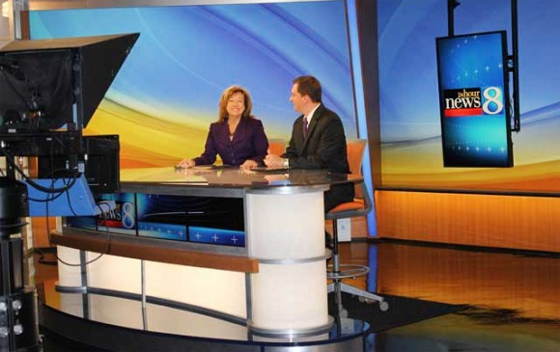 The new set follows after LIN TV stations WANE-TV and WPRI-TV, which also debuted earlier this year. Thanks to Matt and Eric for the tip.